A terrifically detailed and appropriately terrifying sim. Expanded and slightly improved, but still an opaque and cruel game. This is the way the world ends: not with a bang but with a protracted series of bangs, accompanied by famines, screaming winds, droughts, tsunamis and your lynching at the hands of a mob. That's according to this tweaked, expanded re-release of 2011's global suicide strategy simulation and its DLC campaigns. A complex web of depressing data sets (global temperatures, unemployment, infant mortality rates and so on) have been crunched together to form a Megazord of human misery. Viewed at a global level, your purpose is to carefully usher humanity through these trying times, as icecaps melt, Russia erupts into civil war, Japan becomes a swamp and – oh God, why is Africa on fire again? How do you accomplish this feat of planetary redemption? Well, mostly you don't, and the world burns. However, you can try – and you do this by deploying cards, before advancing five years and discovering that your good intentions caused children to die in their thousands. These cards are many and varied, and do such things as subsidise alternative fuels, defend against extreme weather and even violently oust hostile regimes. 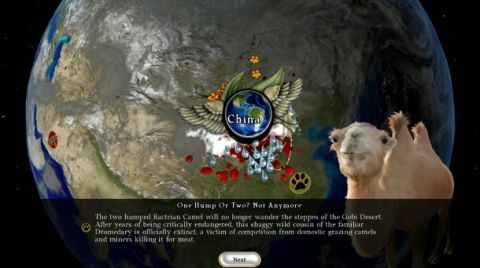 Bundled DLC campaigns, meanwhile, cleverly rejig the simulation to introduce refugee crises, or ignore climate change entirely, allowing you to focus on diminishing resources. Human needs quickly crash into high-minded environmentalism. Put the brakes on polluting industries, and you economically annihilate the developing world. That's a problem because, as a rule, people with dead babies don't give a damn about carbon sequestration. In the end, all these cards can really do is feebly massage the model of planetary doom. You may reach the next century a little less dead than otherwise, but the game offers no silver bullet for these issues. This may be disheartening, but it's also fascinating, complex and important. However, take Tipping Point on its merits as a game rather than an interactive roadmap to selfextinction, and it has issues of its own. The initial release was too hard to 'win', said some players. Well, that's accurate, said others. Tipping Point nonetheless introduces an easy mode – but that won't help you understand how this web of stats is held together, and which cards pull which levers. UI changes make it slightly simpler to turf through the pages and pages of telemetry, but the game still struggles to underscore the interrelationships. At its core is a comprehensive and convincingly bleak simulation of climate change. Dig in, and you'll be rewarded with an understanding of the threat and the few small things we can do to mitigate it. Yet the desire to be a game often gets in the way of the raw data, and vice versa. In the end Fate is something of an ugly compromise – but given the choices we have to make as a species, maybe that's only appropriate.